Archer + Stone are Health & Safety consultants specialising in legionella control who are committed to providing clients with peace of mind by managing the risk from legionella. Through carrying out legionella risk assessments, audits, consultancy and training clients gain the right advice with high quality work at reasonable prices. Please note, it is your duty of care and a legal obligation to carry out legionella risk assessments on ALL work premises - or risk prosecution. Legionnaires' disease is a potentially fatal form of pneumonia which is caused by legionella bacteria which is common in water and soil and can occur in any workplace if the conditions are right. Legionella bacteria can be found in hot and cold water systems, wet cooling systems, spa baths, showers, water features etc and can easily lead to conditions where people can catch the disease. It is preventable and treatable if diagnosed. We visit your premises to assess the risk from legionella bacteria and provide you with a report on where improvements are needed. We offer 3 service levels depending on your requirements. We can audit any existing legionella risk assessments, written schemes (control programme) and management policies etc to ensure your whole control and monitoring plan is up to the required standard. We'll advise you whether all is OK or where improvements should be made. Peace of mind from independent, impartial advice. With over 12 years experience delivering legionella control training courses, we can make sure your facilities / maintenance / caretaking staff have the knowledge,skills and resources they need to carry out effective legionella control checks independently. By doing legionella control in-house, you'll save money year after year. 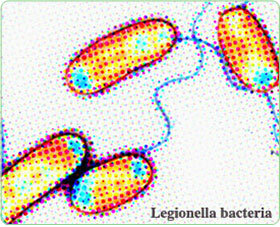 We have several classes of legionella surveys to meet your requirements. These range from the extensive Class 1 survey, to the economy Class 3. All give you full legal compliance. This shows our commitment to high standards of Health & Safety for our staff and clients. From our head office in Leeds, West Yorkshire, Archer + Stone provide a nationwide service for public organisations and private companies throughout the UK.